I am an historian of Australia at war, a frequent commentator on the way Australia commemorates its war experiences, and an avid fun runner. 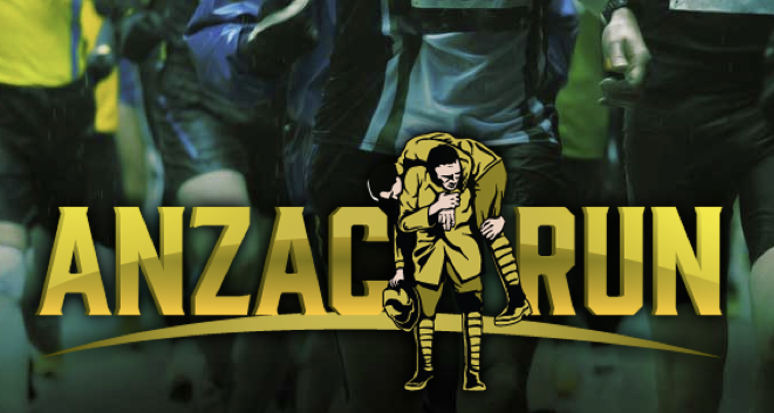 I was not at all surprised to see Anzac-related fun runs and similar events advertised in 2014 and 2015 as part of the enormous complex of popular memorial and commemorative activities. There was for me an irresistible mix of a somewhat masochistic enthusiasm for slogging along roads and cycle paths with fellow runners, and curiosity about how such events would represent and commemorate Australia’s war experience. I thus entered and completed two events in 2015, and have been exposed to numerous emails and ‘Suggested Posts’ and advertisements on Facebook about others. From the point of view of a runner, the two events I entered were reasonable enough, although they both had their disappointments. The Tour of Duty run on 19 April 2015 was well attended, with 564 people completing the 11.4 kilometre course, and another 409 completing the 5.5 km course. The event had its problems – confusion over start times, late course changes and even its name (it had previously been the Anzac Run, but the organisers were required to find an alternative). There were also some problems with the accuracy of the initial results, the course was far too narrow at points, and the commemorative tee-shirt given to all finishers was cheap, tacky and unattractive. The Red Run Remembrance Day Fun Run, Walk and Jog (hereafter the Red Run), organised by Executive Excellence Events, was held on 8 November 2015, starting and finishing at Ballymore Stadium, and included running and walking events of 5.5 km and 11 km. Less well attended with approximately 242 competitors, the Red Run was marred by some poor marshalling (a runners’ curse, and often a feature of events organised by non-runners) and by a timing fault that meant no official times for anyone. But apologies were profuse and all participants were offered free entry into the 2016 version of the event – although, as it turned out, there was no 2016 event. It takes a lot to ruin a morning run along the banks of the Brisbane River in the former case, or along creek-side bike trails in the latter, and a lot can be forgiven. But the shoddy organisation and management of both runs, perhaps inspired by a desire to replicate the events of Gallipoli and the Western Front with just that extra bit of authenticity, were unfortunate and blighted the experience for many competitors. There is nothing wrong with fun runs in support of causes or occasions. They are held by a variety of organisations and community groups to raise money for cancer research, autism, community services and any number of other charitable causes. It’s a relatively simple recipe – put on a run and hopefully attract enough participants and sponsors to cover costs. Any surplus is combined with individuals’ event-related fundraising and donations, and the financial payoff is augmented by the publicity generated. From a runner’s perspective, part of the trick is to simply take these events for what they are – and not expect that they will be organised with the same precision as more popular running events organised by those with extensive experience – such as the City2Surf in Sydney or any of Australia’s numerous marathon festivals. From an historian’s perspective, such events should be recognised as one of the many ways that people encounter and connect with history. Anna Clark reminds us that most people engage with history outside the methods and modes of professional historians, and instead rely on practices such as re-enactment, recreation and connection with place. It is through encounters with places and stories, rather than academic writings, that people formulate their historical consciousness, that they arrive at a version of the past that they find affirming or at least coherent and tolerable – ‘a past they can live with’ as Alastair Thomson memorably termed it when talking of how veterans ‘compose’ their past. I suggest that activities such as Remembrance Day or Anzac Day runs have a similar purpose and perform a similar function. They contain elements of time-travelling, pilgrimage and a re-enactment. There is usually some connection with place, such as a significant war memorial, and the resonances extend to rituals and slogans surrounding the run, the re-enactors and serving defence force members who attempt to lend an air of military authenticity, and the language of the runs’ promotion. These are ways in which people can experience the past – certainly not the ‘history’ that historians recognise – but a popular manner of engaging with the past on the terms of the present. The runs in which I took part included former or current defence personnel attending in World War I-style uniforms, and bearing World War I-style arms (see Figure 1, below left). Numbers of these runners manoeuvred a field gun around the Tour of Duty run (Figure 2, below right). In the previous event in 2014 the course was completed by stretcher bearers in Great War AIF garb, and in both cases runners were sent on their way after the performance of Anzac staples, such as the reciting of odes, the playing of bagpipes, and the sounding of the Last Post. 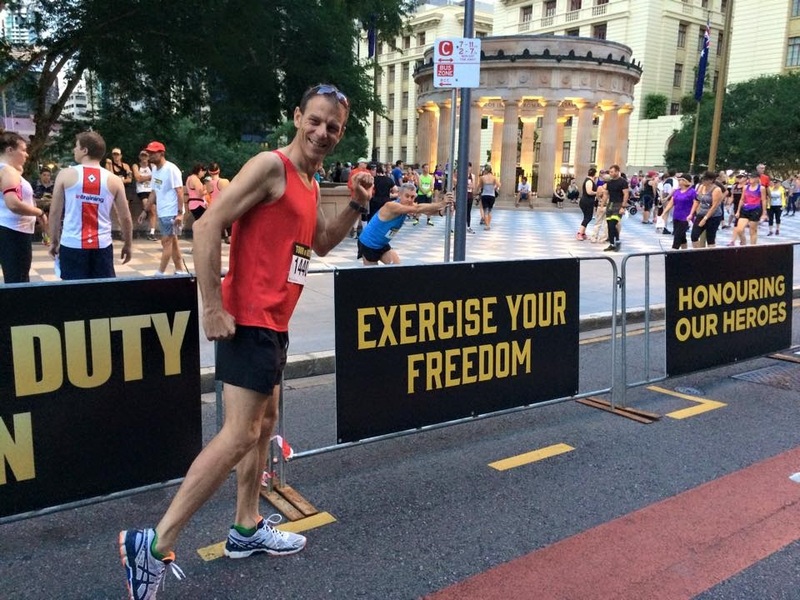 Runners were enjoined to ‘Exercise your Freedom’ (Figure 3, below left) and told that they were ‘Honouring our Heroes’ (Figure 4, below right), the medals for the Tour of Duty run evoked Mateship, and those who completed the Remembrance Run were given a Poppy to place on a wall before either leaving or watching a Remembrance Day rugby match. Modern-day artillery pieces and an Army band at the completion of the Tour of Duty run further augmented the military flavour of the events. Such events are widespread around Australia – there have been numerous Anzac and Gallipoli and Remembrance runs, as well as a variety of similar ‘stomps’ held to commemorate the centenary of World War I. The Australian Running Calendar website lists four events containing the word ‘Anzac’ for 2014, eight for 2015 and four for 2016. ‘Gallipoli’ featured in the title of three events for each of 2014, 2015 and 2016, while Remembrance featured just once. 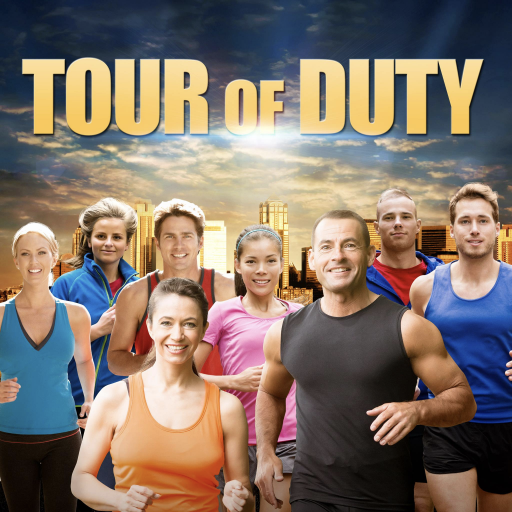 ‘Tour of Duty’ featured twice in 2015, with runs in Melbourne and Brisbane, after the organisers were apparently instructed to change the name from ‘Anzac Run’ – although the rebranding remained inconsistent thereafter. As well as the regulation fun runs over distances of up to 10-15 km, which most recreational runners are capable of completing, event organisers have also put on more testing challenges. The ‘Kokoda Challenge’, a team event run on trails over distances of between 15 km and 96 km, has operated in three Queensland locations and outside Melbourne since 2012, and raises money for the Kokoda Youth Foundation. It also lists one of its goals as being to ‘raise public awareness of the 1942 Kokoda campaign to the Australian people’. Such events mimic the journey of Australian soldiers over the Kokoda Track in 1942, and offer a light, cheaper and more convenient version of the Kokoda Track pilgrimages and treks run by a number of tourist companies. The distance for the longer Australian-based events is the same as the length of the actual Trail – 96 km – but avoids the inconvenience and risk of getting to and navigating the real thing. There is thus no connection through ‘place’, but through enduring a walk or run over a proxy of the actual place. Similarly, an Anzac Day Challenge began as part of a Sydney Trail Running series in 2015, and continued in 2016. The event was initially a single event of 100 km but, after considerable success in 2015 when the event claims to have raised $130 000 for Soldier On and Mates4Mates, the options were expanded for 2016. 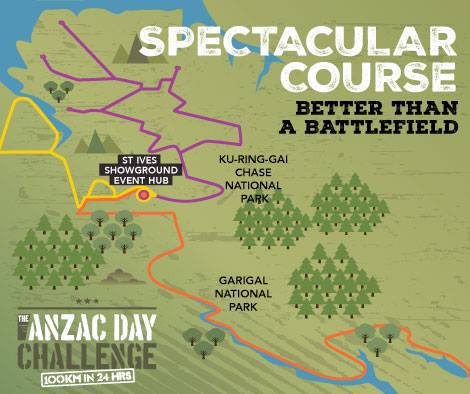 As well as the Anzac Day Challenge, which required competitors to complete 100 km in 24 hours, entrants could choose from the slightly less demanding distances of 65 km, 40 km and 15 km, which respectively comprised the Lone Pine Challenge, the Nek Challenge and the Hill 60 Challenge. Approximately 350 people completed one of these challenges in 2016. The course was promoted as spectacular, and as ‘better than a battlefield’ (Figure 5). Figure 5. Anzac Day Challenge Facebook page. 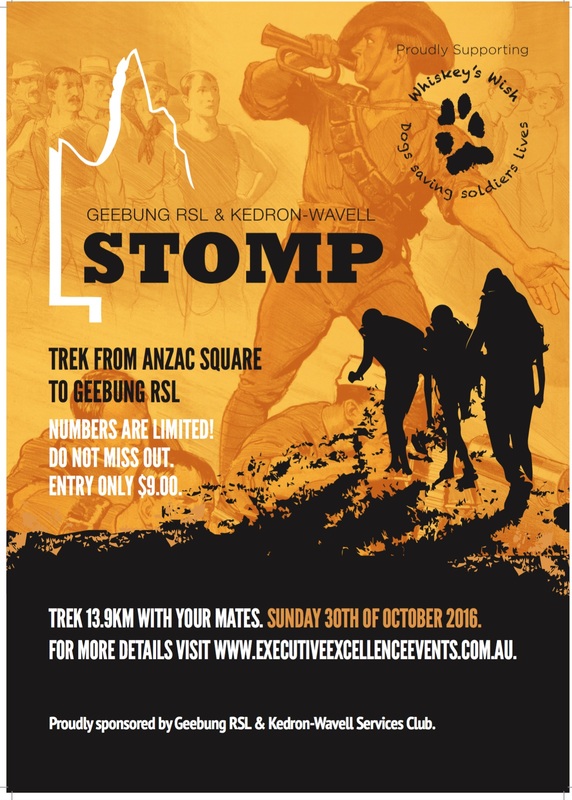 In a similar vein, Executive Excellence Events, the same company responsible for organising the Red Run in Brisbane in 2015 and the Gallipoli Run in Ipswich in 2016, has held a number of ‘stomps’. These typically commence at the Anzac Square memorial in Brisbane and cover between 12 and 28 kilometres to a suburban RSL branch. There have also been longer treks as part of a ‘World War I Challenge’, such as a 100 km trek from The Gap in Brisbane to Woodford. Numbers for these runs are understandably lower than for the fun run events, but they still attract significant interest. Bruce Barker, the Director of Sales and Special Events at Executive Excellence Events, claims that the stomps attracted about 800 participants across the five events in 2016, while the four treks attracted 310 people. The re-enactment element of such events, as for fun runs, is clear from the promotional images and text. The ‘stomp’ and the Tour of Duty run (before its forced name change) used images that linked hiking and running to elements of the Anzac experience, with the stomps going somewhat further by using, rather cleverly, an adapted Great War recruitment poster aimed at sportsmen (see Figures 6 and 7). Figure 6. Tour of Duty Facebook page. Figure 7. Executive Excellence Events. Promotional emails similarly informed potential ‘stompers’ that they would be ‘walking in the “FOOTSTEPS OF OUR FOREFATHERS” as they moved into the next strategic position in preparation for battle’. Recipients were also informed that the stomp was ‘a walking journey of remembrance in group formation, not a race’ and that if they entered they would ‘have the opportunity to carry a brick engraved with the name of a fallen Queensland soldier from WWI, after which the bricks would form part of a war memorial at Woodford’. There is little to no sign of these events abating with the passing of the centenary of the Gallipoli landings. 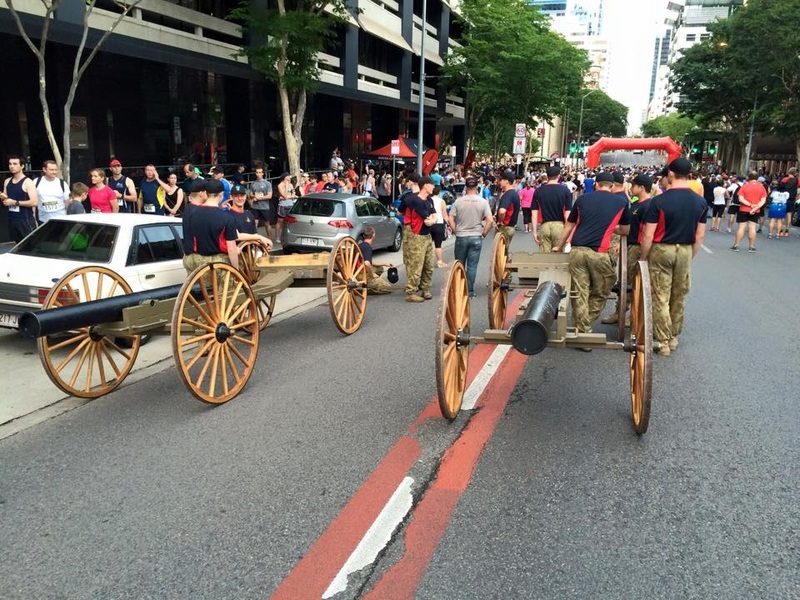 Executive Excellence Events alone, for example, currently has four two-day treks, five ‘stomps’ and three fun runs planned for Brisbane and surrounding areas for 2017, and the intention is for the events to continue on after the centenary years have passed. The Kokoda Challenge continues, and at least one 2017 run already listed on the Australian Running Calendar website has ‘Anzac’ in its title. More can be expected. David Carter once commented that Australians are not used to contemplating a controversial and troubling history, but that ‘we’re going to have to get used to it’. Stuart Macintyre has similarly suggested that history functions as ‘an irritant, rubbing away at the national conscience’. But it seems clear that many prefer to engage with the past, including their military past, only on terms which affirm their identity and reinforce their understandings of themselves and their nation. This is the past as a place of untroubled reflection, as adventure and voyeurism, as immersion and entertainment. Paul Ham and Peter Fitzsimons produce this sort of material in literary form with their numerous histories of Australian battles – and they vastly outsell more qualified but less celebratory historians such as Craig Stockings and Joan Beaumont. It is also evident in the (troubled) Camp Gallipoli phenomenon, in pilgrimages, movies and television programs, in Anzac memorabilia that ranges from replica medals to teddy bears and beer coolers, and in digital media. People engage with this material, and play with it, and imbibe it, but usually only in self-affirming ways. Even the expressions of grief and loss about dead Anzac relatives appear so often to be manufactured expressions of the worth of the commemorator, who grieves over a distant relative or ancestor that they would otherwise have no interest in, as a manner of displaying and performing their own sentimentality and patriotism. History is consumed, like fast food, for its taste rather than its nutrition. ANZAC day is now commemorated by Australians all around the world, recognising the courage and sacrifice of our gallant men and women in numerous conflicts waged over the course of the past century … The ANZAC legacy encapsulates the enduring Australian spirit of resilience, mateship, courage and sacrifice … Lest We Forget. This message was further reinforced in the medals given to all participants. In 2014 these medals were engraved with an explanation that Anzac is not ‘merely’ about loss, but also about ‘courage and endurance, and duty, and love of country’. No mention, predictably, of imperiled civil liberties, the persecution of minorities, the destructiveness of war, or even of what soldiers in our past wars really experienced, thought and felt. Such is not the purpose of these forms of historical engagement. Instead, they are affirmations of existing and often shallow historical consciousness where participants are invited to worship at the altar of Anzac. Participants in these running and trekking events bear some similarities to the pilgrims who travel to Gallipoli for Anzac Day. They participate in a proxy of the original experience and often express an emotional connection with the past events that are commemorated; but the meanings they attach to the experience are predefined and imbibed, rather than discovered. Comments on event Facebook pages suggest that participants do get something out of the event, rather than simply participating in a sporting or recreational occasion. One commented on the Tour of Duty Facebook page: ‘The sentiment and reason behind completing this run is different to other runs. 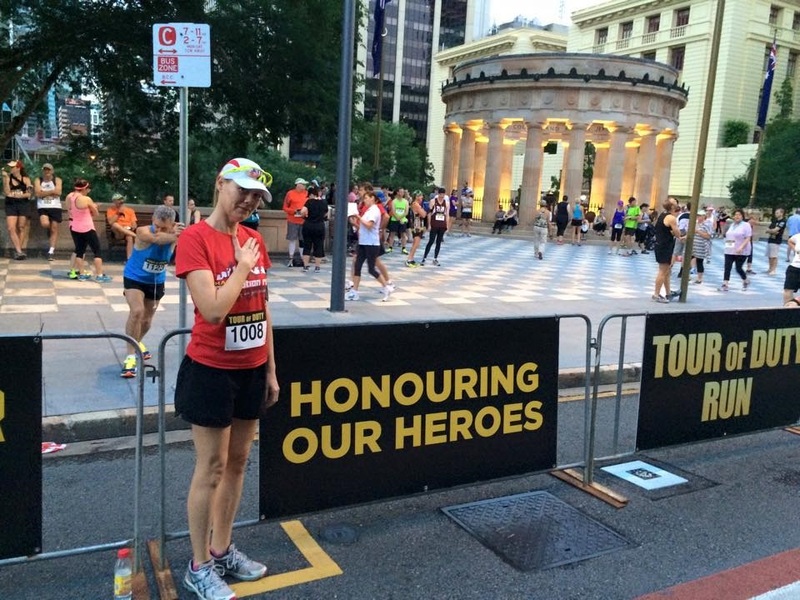 This is not a fun run, but a run of determination, of respect, of sacrifice.’ Another claimed that the two Anzac-Tour of Duty Runs she had completed were ‘the most amazing emotional runs I’ve done’. 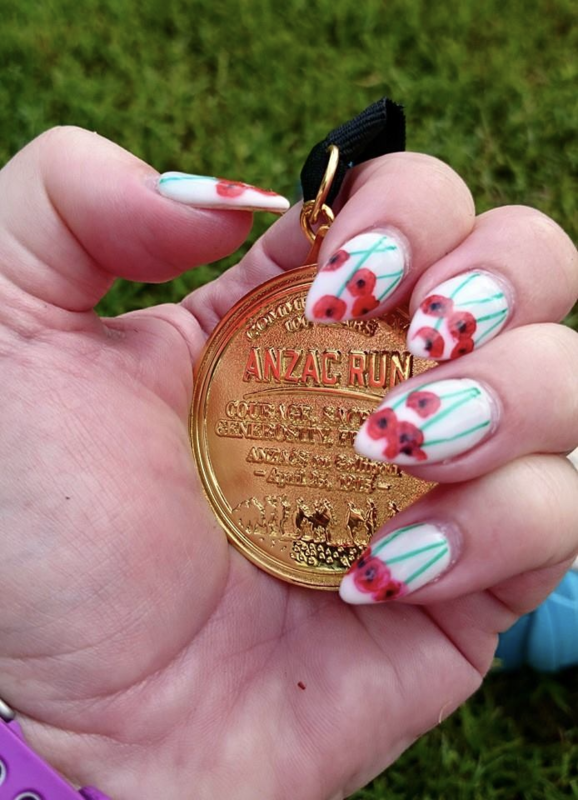 Yet another posted an image of her medal clutched in her hand, with the fingernails painted in considerable detail with poppies (see Figure 8). Like Scates’s pilgrims the participants learn little, but appear to feel much; and this is what they come for. All this is, of course, immensely frustrating for academic historians. Anzac is perpetually cloaked in rhetoric that makes any exploration of and learning from the realities of the past more difficult than it should be. Australians, as Mark McKenna and others have often noted, appear to have lost the ability to debate Anzac and Anzac Day with any critical faculty. Indeed, historians who have dared to question elements of the Anzac legend have often come in for repeated, sustained and sometimes vicious abuse. This is the past as an article of faith and the object of veneration; not as history open to critique and interrogation. And yet, as historians, we should not be too snooty. We can hardly expect members of the public to dash across replicas of No Man’s Land, or run and trek through recreated trenches. If they prefer an emotional engagement to reading academic treatises, that is their choice. What we need to do, as ever, is look for the ways in which people engage with the past, and then work with them on their terms rather than ours. Fun runs and treks offer limited possibilities – but surely they offer some, if organisers are willing to engage. It would have been useful, for example, to remind the organisers of the Anzac-Tour of Duty run that not all Australian servicemen and women have been white, and to suggest that they might consider an alternative to one of their most often-used images (see Figure 9). Alternatively, we can leave fun runs and similar events alone, and continue to seek newer and better ways of engaging the public so that they at are least presented with a platter of possibilities, including more complicated messages offered through newspapers, websites, museums and other media. People might still opt for the fast food rather than the balanced meal, but we need to at least ensure they have the choice. We should, too, be suitably modest in the face of people who raise money for good causes. The Tour of Duty record here is somewhat sketchy and opaque, and it is not clear how much, if any, of the funds raised through entry fees were passed on to charities. Participants were encouraged to raise funds through their own efforts, but might well have also anticipated that some of their entry fees would be passed on to charitable causes. It is not clear that this happened. Bruce Barker, by contrast, claims that his events have raised, to the end of 2016, some $100 000 for Whiskey’s Wish, Soldier On and Legacy, and this money has come primarily through participants’ entry fees. Tacky, ahistorical and often poorly organised these events might be, but they do some good – for competitors who take part, and for the causes they assist. Of all the memories I have of the two events, however, one stands out for me as particularly evocative of the whole Anzac commemorative frenzy. On a relatively short but narrow and curved section of path, downhill and walled on both sides, not far into the 2015 Tour of Duty run, a woman in Islamic dress had found herself, walking uphill, in the path of some of the leading runners. She appeared to have moved to one side, but was trapped as hundreds of Australians celebrating Anzac thundered past her. I noted the look of terror on the woman’s face as she pressed herself harder up against the wall, for there was simply no escape. She could not cross the stream of runners, and would not have been able to do so for several minutes after I passed her. There was no malice or ill-intent on the part of the runners, and there was nothing anyone could have done to help her – she was simply trapped. She stands as something of a metaphor for the self-centered nature of Anzac, for predominantly Anglo-Celtic Australians celebrating their military heritage heedless of others. * Martin Crotty is Head of School and Associate Professor in Australian History, University of Queensland. Photographs by the author, unless otherwise credited. Tomato Timing, Tour of Duty race results. Anna Clark, ‘The place of the past: remembering Australia’, History Council of Victoria Annual Lecture, 20 October 2016, pp. 4-5, 12. See also Anna Clark, Private Lives, Public History, Melbourne University Press, 2016. Alastair Thomson, ‘A past you can live with: Digger memories and the Anzac Legend’, Oral History Association of Australia Journal, no. 13, 1991, pp. 12-18. For a fuller development of the idea of how we ‘compose’ memories that we can live with, see Alastair Thomson, Anzac Memories: Living with the Legend, Oxford University Press, Melbourne, 1994. New edition, 2013. See the Tour of Duty photo galleries and the relevant Facebook pages. Kokoda Challenge Facebook page; Kokoda Youth Foundation. Bruce Barker, conversation with author, 21 December 2016. Email from Executive Excellence Events, 27 September 2016. Executive Excellence Events ; Bruce Barker, conversation with author, 21 December 2016. David Carter, ‘Working on the past, Working on the future’, in Richard Nile & Michael Petersen (eds), Becoming Australia: The Woodford Forum, University of Queensland Press, Brisbane, 1998, p. 12. Stuart Macintyre, ‘Challenging histories’, paper presented at the Challenging Histories conference, State Library of Victoria, 5 October 2001, p. 3. See for example, Romain Fathi, ‘Connecting spirits: the commemorative patterns of an Australian school group in Northern France’, Journal of Australian Studies, vol. 38, no. 3, July 2014, pp. 1-15. Tour of Duty Facebook page. See the debate on this matter between Bruce Scates on one hand, and Mark McKenna and Stuart Ward on the other. Mark McKenna & Stuart Ward, ‘ “It was really moving mate”: the Gallipoli pilgrimage and sentimental nationalism in Australia’, Australian Historical Studies, vol. 38, no. 129, April 2007, pp. 141-51; Bruce Scates, ‘The first casualty of war: a reply to McKenna’s and Ward’s “Gallipoli pilgrimage and sentimental nationalism” ‘, Australian Historical Studies, vol. 38, no. 130, November 2007, pp. 312-21. See Bruce Scates, Return to Gallipoli: Walking the Battlefields of the Great War, Cambridge University Press, Cambridge, 2006. See Mark McKenna, ‘Patriot Act’ in The Australian newspaper’s Literary Review, 6 June 2007, pp 1, 3, 14. See also Clark, Private Lives, Public History, pp. 55-56. Clark, Private Lives, Public History, p. 56; Martin Crotty & Craig Stockings, ‘The minefield of Australian military history’, Australian Journal of Politics and History, vol. 60, no. 4, December 2014, pp. 580-91. 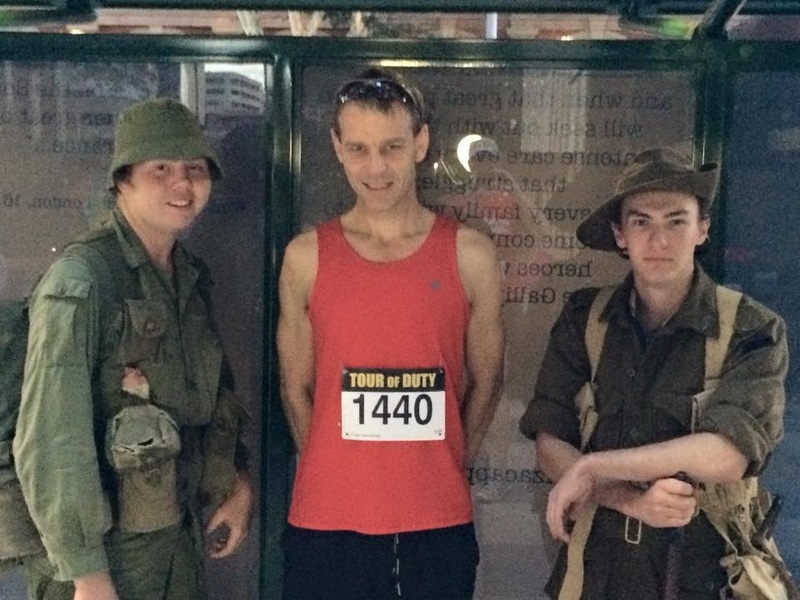 See Honest History’s 2014 research on Tour of Duty-Anzac Run.